I've worn this mani so many times I'm surprised I'm just now blogging it. Zoya released Kate and Belle as part of the Limited Edition exclusive to Birchbox Blogger Collection from the spring of 2012. Zoya Kate is a yummy reddish coral jelly. It is the perfect jelly. I absolutely adore this polish. I maybe should get a back up. 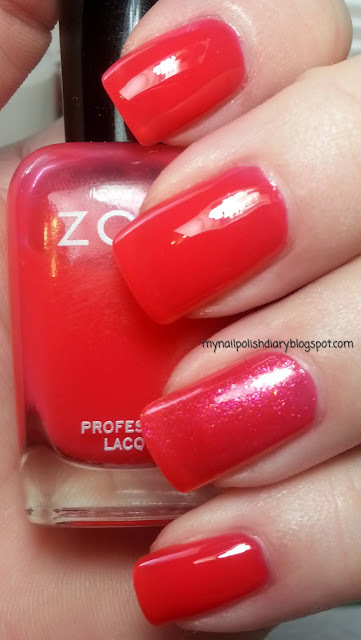 Zoya Belle is a sheer grapfruit pink base with lots of pink shimmer. It's heavenly and really looks great added to Kate. It's pretty on it's own as well, but I prefer it worn over Kate. Next time I wear it I think I might layer it over Coraline from the same collection.